David Bowie was a man of many faces. Over the course of his career, he evolved his musical style countless times, often donning different musical personas to suit the approach. 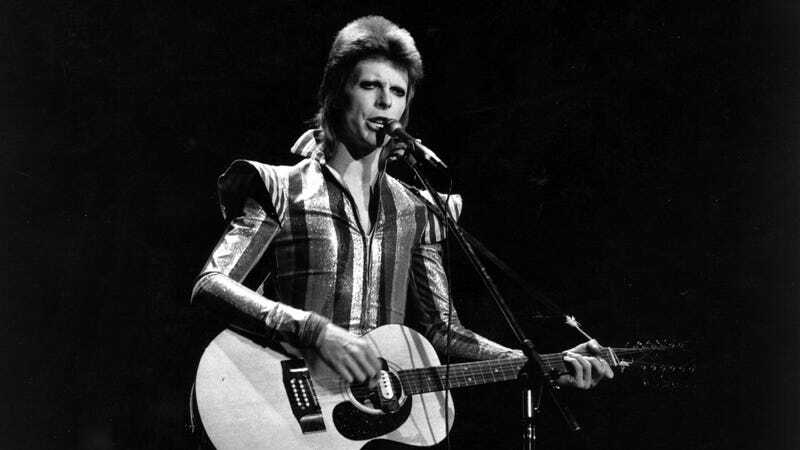 But his most famous creation—with apologies to the Thin White Duke—was undoubtedly Ziggy Stardust. Now, as reported by the BBC, archivists have uncovered the first television appearance of Bowie as Ziggy, which was thought to be lost to the sands of time. The original 1972 tape, which showcases Ziggy’s debut on ITV’s Lift Off With Ayshea, was wiped along with the rest of Lift Off when the company sent the tapes to be digitized. Luckily, a fan managed to save a recording of the performance, which is now being “baked” by the BBC in a process that helps reverse the effects of degradation. The hope is that it will appear in Francis Whately’s upcoming BBC2 documentary, David Bowie: Finding Fame, which is slated to premiere next month. Currently, the earliest recording of Bowie embodying the Ziggy persona comes from a Top Of The Pops performance that same year. There, he’s already sporting his iconic snakeskin jumpsuit and explosion of red hair. A performance from even earlier in 1972 shows a more aesthetically subdued Bowie playing “Five Years,” the opening track from his forthcoming concept album. This new footage from Lift Off could be the connective tissue between these two Bowies, giving us our first glimpse at the birth of Ziggy.